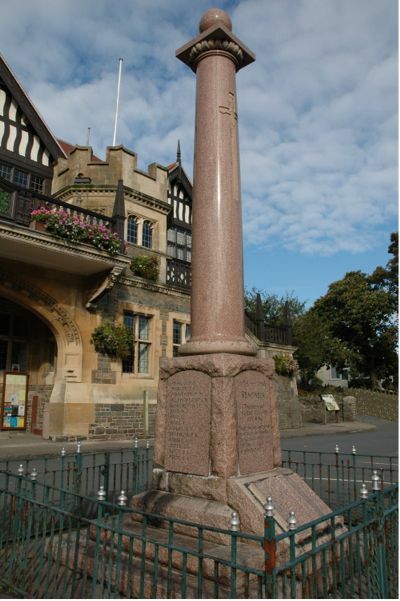 Lynton & Lynmouth's War Memorial stands outside the Town Hall. The original 1914 - 1918 Memorial is constructed of a combination of red granite and polished red marble and consists of a graceful Romanesque column topped by a polished marble ball, which is mounted on a small granite slab. 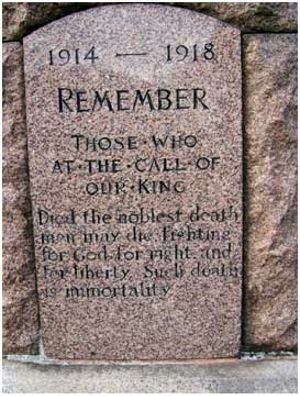 Polished marble plaques on the four sides of the lower plinth carry the inscription and the names of the fallen. A polished marble book has been attached to the inscription face bearing the names of those who died between 1939 and 1945. In March 2009, Duncan Brownlie offered us the use of his extensive research on the War Dead of Lynton and Lynmouth, together with many of his photographs. His hard work has produced an enormous amount of detailed information, which constitutes a worthy tribute to the men who are named and includes information on men whose names were recorded on other memorials in the area. We wish to record our gratitude to Duncan for enabling the creation of this update. All material used from this point is the copyright property of Duncan Brownlie. Lieutenant Humphrey John Baillie MC, 2nd Battalion, Dorsetshire Regiment. He was killed in action on the 2nd March 1916 aged 23, and is buried at Kut War Cemetery, Iraq. Son of the Rev. William Gordon Baillie and Mary Harriet Baillie of Sutton Mead, Moretonhampstead, Devon. Born at Newnham-on-Severn, Gloucestershire. He is also listed on the Lee Road Cemetery 1914 – 18 Memorial Plaque. He is also recorded on the Lustleigh War Memorial, Devon; and in the casualty roll of honour of former pupils of Haileybury College, a public boarding school in Hertfordshire. His Medal Index Card states that he landed in Mesopotamia on the 6th November 1914, and was awarded the Military Cross, 1914/15 Star, British War Medal and Victory Medal with Mention in Despatches oak leaf. It records his next of kin as the Rev. Gordon Baillie, of The Vicarage, Lynton; and Sutton Mead, Moretonhampstead, Devon. Gunner 330385 Augustus Charles Bibbings, 353rd Siege Battery, Royal Garrison Artillery. He died of wounds on the 20th September 1917 aged 20, and is buried at The Huts Cemetery, Belgium. He is also listed on the Lee Road Cemetery 1914 – 18 Memorial Plaque. Soldiers Died in the Great War records that he was born at Northlew, Devon; and enlisted at Barnstaple. 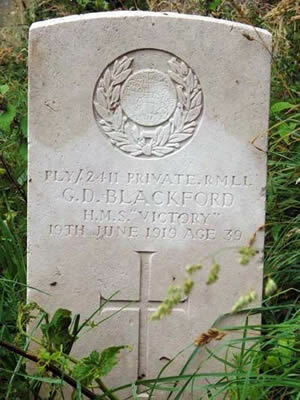 Private PLY/2411 George Davey Blackford, HMS Victory, Royal Marine Light Infantry. He died on the 19th June 1919 aged 39, and is buried at the old Lynton Church Cemetery. Son of John Blackford; husband of Ethel Minnie Blackford of 30 Stratford Road, Kensington, London. Born at Ilfracombe, Devon. Army Reserve 3rd December 1915; entered 19th September 1917; draft for BEF 12th February 1918; POW 25th March 1918; repatriated 6th December 1918. Discharged as Invalided 3rd May 1919 (discharge cancelled, to have 2 months leave). Died from Nephritis whilst on leave at ‘Oaklands’, Lynton, 19th June 1919.